Computer chip giant Intel unveiled a major new push Monday into wearables and connecting everyday devices as it seeks to leapfrog the competition in mobile computing. 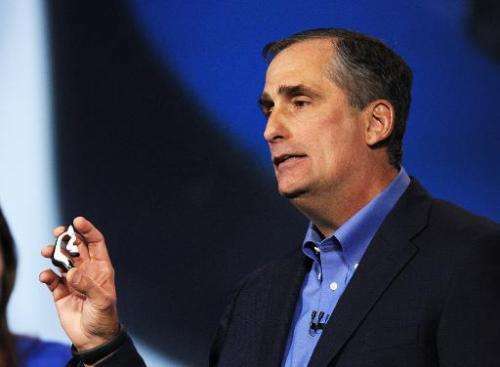 Chief executive Brian Krzanich said Intel would produce, on its own or with partners, a range of products from a health monitor integrated into baby clothes to heart monitor in earbuds. Speaking at the opening keynote of the massive Consumer Electronics Show in Las Vegas, Krzanich showed the company's new "personal assistant" dubbed Jarvis, which is Intel's answer to the voice-activated Google Now and Apple's Siri. Intel will be producing a smartwatch with "geofencing" which allows families to get alerts if children or elderly parents leave a specific geographic area. The new devices shown to the large CES crowd will all be available this year, Krzanich said, without offering details on pricing or specific partners for the products. Krzanich said Intel is taking a new approach to wearable computing, seeking to address specific problems with the simplest technology. He showed a turtle-shaped sensor on baby clothing which can send information to a smart coffee cup about an infant's breathing, temperature and position. He said the earbuds would enable runners and athletes who already listen to music while exercising to get detailed health information in real time. "We want to make everything smart. That's what Intel does," he said. The chief executive who took the reins at Intel last year said the new technology all revolves around its new chip called Edison, which is said integrates a full-fledged computer in the size of a memory card. He said Intel will be partnering with the luxury retailer Barneys New York, the Council of Fashion Designers of America and design house Opening Ceremony to explore and market smart wearable technology. And Intel will offer $1.3 million in prizes for other developers who come up with new ideas for wearable computing, including a first prize of $500 million. "This will allow creation and innovation to come to life" in wearables, he said. To address questions about security, Intel will offer its McAfee mobile software free of charge. "We believe this will allow this ecosystem to flourish." Intel remains the world's biggest producer of chips for personal computers but has been lagging in the surging mobile marketplace of tablets and smartphones. The new initiative could allow the California firm to get a bigger slice of the mobile market's newest iterations. Intel also said its new chips would allow for a "dual boot" that enables computer makers to include Microsoft Windows and Google Android on a single device, with users able to change with the switch of a button. "There are times you want Windows, there are times you want Android," he said. "You don't have to make a choice, you can have both." Intel also unveiled a new 3D camera called RealSense which can be integrated into tablets and enable users to produce and manipulate three-dimensional images. This can for example allow a user to design a toy or other object and then send it to a 3D printer. Intel produced chocolate bars using the technology which were handed out to the attendees at CES. 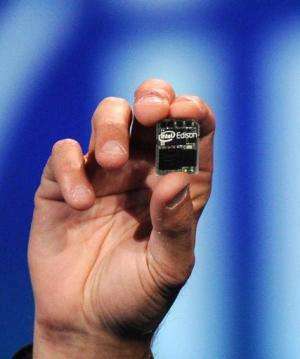 Mooly Eden, senior vice president for perceptual computing, said Intel is moving to a more intuitive kind of computing. "We'll make human-computer interaction natural, intuitive, immersive. We'll make it more human," Eden said. "We finally removed the fiction from science fiction and made it real." Intel will implement a new policy in 2014 ending the use of "conflict minerals," from the Democratic Republic of Congo, as part of an effort to reduce the money flowing from the technology sector to those committing atrocities, Krzanich said. "We are inviting the entire industry to join us in this effort," he said. "He showed a turtle-shaped sensor on baby clothing which can send information to a smart coffee cup about an infant's breathing, temperature and position." Cool. Except I can't figure out why a coffee cup would want to know about an infants temperature.